Derek Riordan was the creator as Hibernian came from a goal behind to begin their Scottish Premier League campaign with a win away to Motherwell. Motherwell deservedly took the lead after 13 minutes when John Sutton scored from close range. Anthony Stokes fired home following a free-kick by Riordan, whose second-half cross was poked in by Paul Hanlon. Riordan set up Liam Miller for a nice finish before Jamie Murphy replied after Colin Nish conceded a penalty. The goals tally did not quite match last season's incredible 6-6 draw between the sides, but Hibs will be delighted with their comeback in a thrilling encounter. It was no surprise that Motherwell were unchanged from the side that defeated Aalesund 3-0 at Fir Park to progress in the Europa League, which meant that Nick Blackman and fellow new signing Esteban Casagolda had to wait to make their debuts from the bench. While Craig Brown's side had shown an eye for goal, Hibs had displayed a blind spot for stopping them and Graham Stack was given the job of stemming the flow as he replaced Graeme Smith between the sticks. Paul Hanlon also came into defence in place of the suspended Ian Murray following the Edinburgh side's European exit against Maribor. But Hibs manager John Hughes would not be swayed from his policy of playing three men up front despite memories of his side's last visit to Fir Park, when they let Motherwell back into the game after having a four-goal lead. Indeed, it was Hibs who threatened first when Stokes used his strength to ease aside Mark Reynolds and only the outstretched leg of goalkeeper Darren Randolph prevented the striker finding the far corner with his low drive. Hibs lost six goals to Maribor over two legs and, with Motherwell playing the neater football, the visiting defence was again found wanting after 13 minutes. Murphy's low ball into the six-yard box was steered past Stack by Sutton, who tested the goalkeeper with another close-range effort then miss-kicked in front of goal after similar moves minutes later. It took a poor clearance from Reynolds to hand Hibs with a clear-cut opportunity, but Kevin McBride's powerful drive from just inside the penalty box was a nice height for the agile Randolph to palm the ball clear for a corner. With Riordan in their ranks, however, Hibs can always threaten at set-pieces and his curling ball into the six-yard box was forced across goal by Sol Bamba and Stokes side-footed home from four yards. 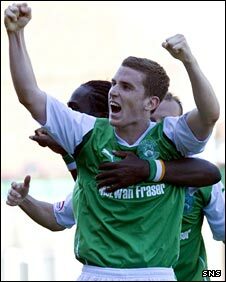 Stokes went close to giving a rejuvenated Hibs the lead four minutes into the second half with a curling drive from 20 yards that Randolph did superbly to turn wide of the post with his fingertips. However, Motherwell settled again and Steven Saunders rose above Hanlon only to head straight at Stack. A Chris Humphrey cross beat the goalkeeper and crashed off the inside of the post before bouncing clear and, when the winger gathered again, his next ball into the box gave Sutton the chance to head a few feet wide. It was now an end-to-end affair and a blistering Riordan drive from 14 yards forced Randolph to parry the ball wide. From the corner, the goalkeeper failed to connect with his punch under pressure from Bamba and Hanlon bundled the ball over the line at the back post. Humphrey fired into the side netting, but Hibs appeared to put the game beyond the home side when Riordan rolled the ball into the path of Miller, who slotted the ball under the goalkeeper from 12 yards. Motherwell replied immediately when Nish conceded a penalty by tugging the shirt of substitute Blackman and Murphy tucked the ball away from the spot. 90:00+3:17 The referee signals the end of the game. 90:00+3:01 Shot by Keith Lasley (Motherwell) right-footed from centre of penalty area (12 yards), blocked by David Stephens (Hibernian). 90:00+2:34 Defending throw-in by Steven Saunders (Motherwell). 90:00+2:04 Corner from left by-line taken short right-footed by Derek Riordan (Hibernian). Corner from left by-line taken short right-footed by Kevin McBride (Hibernian). 90:00+1:51 Shot by Anthony Stokes (Hibernian) right-footed from left side of penalty area (12 yards), save (parried) by Darren Randolph (Motherwell). 90:00+1:19 Attacking throw-in by Stevie Hammell (Motherwell). 90:00+0:57 Defending throw-in by Michael Hart (Hibernian). 90:00+0:10 Defending throw-in by Stephen Craigan (Motherwell). 89:11 Shot by Derek Riordan (Hibernian) right-footed from centre of penalty area (12 yards), missed left. Goal kick taken long by Darren Randolph (Motherwell). 88:05 Goal kick taken long by Darren Randolph (Motherwell). 87:37 Attacking throw-in by Michael Hart (Hibernian). 86:54 Foul by Nick Blackman (Motherwell) on Michael Hart (Hibernian). Free kick taken right-footed by Graham Stack (Hibernian) from own half, passed. 86:42 Foul by Anthony Stokes (Hibernian) on Stephen Craigan (Motherwell). Free kick taken left-footed by Stephen Craigan (Motherwell) from own half, passed. 86:10 Cross by Steven Saunders (Motherwell), header by Nick Blackman (Motherwell) from centre of penalty area (12 yards), missed left. Goal kick taken long by Graham Stack (Hibernian). 85:13 Attacking throw-in by Stephen Craigan (Motherwell). 84:53 Attacking throw-in by Stephen Craigan (Motherwell). 84:20 Goal kick taken long by Graham Stack (Hibernian). 83:12 Substitution Motherwell substitution: Chris Humphrey replaced by Esteban Casagolda (tactical). 83:07 Defending throw-in by Michael Hart (Hibernian). 82:56 Defending throw-in by Steven Saunders (Motherwell). 82:03 Attacking throw-in by Michael Hart (Hibernian). 81:23 Defending throw-in by Stevie Hammell (Motherwell). 80:32 Booking Souleymane Bamba (Hibernian) booked for unsporting behaviour. 80:23 Foul by Souleymane Bamba (Hibernian) on Nick Blackman (Motherwell). Free kick taken left-footed by Stevie Hammell (Motherwell) from left wing, resulting in open play. 79:38 Foul by Mark Reynolds (Motherwell) on David Stephens (Hibernian). Free kick taken right-footed by Graham Stack (Hibernian) from own half, resulting in open play. 79:19 Shot by Derek Riordan (Hibernian) right-footed from centre of penalty area (12 yards), over the bar. Goal kick taken long by Darren Randolph (Motherwell). 78:16 Substitution Hibernian substitution: Colin Nish replaced by David Stephens (tactical). 78:09 Goal kick taken long by Darren Randolph (Motherwell). 77:32 Attacking throw-in by Stevie Hammell (Motherwell). 77:26 Defending throw-in by Stevie Hammell (Motherwell). 77:08 Defending throw-in by Stevie Hammell (Motherwell). 76:25 Attacking throw-in by Nick Blackman (Motherwell). 75:27 Foul by Chris Hogg (Hibernian) on John Sutton (Motherwell). Free kick taken right-footed by Jamie Murphy (Motherwell) from left channel, passed. 75:17 Foul by Anthony Stokes (Hibernian) on Stephen Craigan (Motherwell). Free kick taken right-footed by Darren Randolph (Motherwell) from own half, resulting in open play. 74:43 GOAL - Jamie Murphy:Motherwell 2 - 3 Hibernian Placed penalty taken right-footed by Jamie Murphy (Motherwell) (bottom-right of goal), scored.Motherwell 2-3 Hibernian. 73:48 Foul by Kevin McBride (Hibernian) on Nick Blackman (Motherwell). 73:25 Booking Liam Miller (Hibernian) booked for unsporting behaviour. 73:03 Substitution Motherwell substitution: Tom Hateley replaced by Nick Blackman (tactical). 72:06 Assist (pass) by Derek Riordan (Hibernian) from left channel. 72:06 GOAL - Liam Miller:Motherwell 1 - 3 Hibernian Goal by Liam Miller (Hibernian) right-footed (bottom-right of goal) from centre of penalty area (12 yards).Motherwell 1-3 Hibernian. 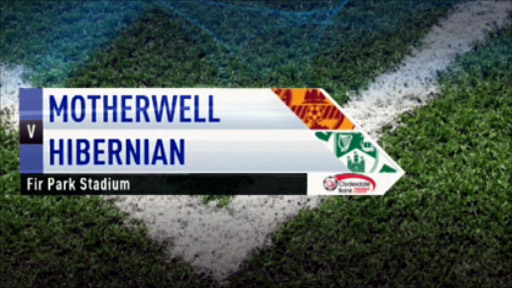 Correction - 69:43 Foul by Paul Hanlon (Hibernian) on Chris Humphrey (Motherwell). Free kick crossed right-footed by Tom Hateley (Motherwell) from right wing, clearance by Kevin McBride (Hibernian). 69:43 Free kick crossed right-footed by Tom Hateley from right wing, clearance made by Kevin McBride. 69:43 Substitution Nick Blackman on for John Sutton. 69:43 Foul by Paul Hanlon (Hibernian) on Chris Humphrey (Motherwell). Free kick crossed right-footed by Tom Hateley (Motherwell) from right wing, clearance by Kevin McBride (Hibernian). 67:47 Attacking throw-in by Stevie Hammell (Motherwell). 67:25 Shot by Anthony Stokes (Hibernian) drilled right-footed from left channel (20 yards), save (caught) by Darren Randolph (Motherwell). 66:38 Defending throw-in by Steven Saunders (Motherwell). 65:59 Defending throw-in by Stevie Hammell (Motherwell). 65:23 Attacking throw-in by Michael Hart (Hibernian). 64:42 Substitution Hibernian substitution: Edwin De Graaf replaced by David Wotherspoon (tactical). 63:27 Assist (cross) by Derek Riordan (Hibernian) from left wing. 63:27 GOAL - Paul Hanlon:Motherwell 1 - 2 Hibernian Goal by Paul Hanlon (Hibernian) (bottom-right of goal) from right side of six-yard box (6 yards).Motherwell 1-2 Hibernian. 62:51 Shot by Derek Riordan (Hibernian) volleyed left-footed from left side of penalty area (12 yards), save (parried) by Darren Randolph (Motherwell). Inswinging corner from left by-line taken right-footed by Derek Riordan (Hibernian) to near post, clearance by Steven Saunders (Motherwell). 62:40 Attacking throw-in by Paul Hanlon (Hibernian). 61:49 Cross/shot by Chris Humphrey (Motherwell) right-footed from right side of penalty area (12 yards), cross by Chris Humphrey (Motherwell), header by John Sutton (Motherwell) from centre of penalty area (12 yards), missed left. Goal kick taken long by Graham Stack (Hibernian). 59:56 Foul by Souleymane Bamba (Hibernian) on John Sutton (Motherwell). Free kick taken left-footed by Stevie Hammell (Motherwell) from right channel, header by Steven Saunders (Motherwell) from left side of penalty area (6 yards), save (caught) by Graham Stack (Hibernian). 59:07 Foul by Colin Nish (Hibernian) on Stephen Craigan (Motherwell). Free kick taken right-footed by Darren Randolph (Motherwell) from own half, resulting in open play. 58:47 Weak shot by Jamie Murphy (Motherwell) volleyed right-footed from left side of penalty area (12 yards), save (caught) by Graham Stack (Hibernian). 58:26 Attacking throw-in by Stevie Hammell (Motherwell). 58:18 Defending throw-in by Michael Hart (Hibernian). 57:39 Goal kick taken long by Graham Stack (Hibernian). 57:11 Attacking throw-in by Steven Saunders (Motherwell). Correction - 56:22 Souleymane Bamba challenges John Sutton unfairly and gives away a free kick. Stevie Hammell restarts play with the free kick. Inswinging corner taken from the right by-line by Chris Hogg, clearance made by Nick Blackman. 56:22 Foul by Souleymane Bamba (Hibernian) on John Sutton (Motherwell). Free kick taken left-footed by Stevie Hammell (Motherwell) from own half, resulting in open play. Inswinging corner from right by-line taken right-footed by Chris Hogg (Hibernian) to centre, clearance by Nick Blackman (Motherwell). 56:08 Shot by Liam Miller (Hibernian) volleyed right-footed from right channel (20 yards), blocked by Stephen Craigan (Motherwell). 54:52 Foul by Steve Jennings (Motherwell) on Anthony Stokes (Hibernian). Free kick crossed right-footed by Derek Riordan (Hibernian) from right wing, resulting in ball out of play. Goal kick taken long by Darren Randolph (Motherwell). 54:16 Defending throw-in by Michael Hart (Hibernian). 52:45 Outswinging corner from right by-line taken right-footed by Chris Humphrey (Motherwell) to near post, comfortable save (caught) by Graham Stack (Hibernian). 52:27 Attacking throw-in by Steven Saunders (Motherwell). 51:48 Foul by Colin Nish (Hibernian) on Tom Hateley (Motherwell). Free kick taken left-footed by Stevie Hammell (Motherwell) from own half, resulting in open play. 50:45 Attacking throw-in by Michael Hart (Hibernian). 49:37 Shot by Anthony Stokes (Hibernian) curled right-footed from left wing (20 yards), save (tipped round post) by Darren Randolph (Motherwell). Outswinging corner from right by-line taken right-footed by Derek Riordan (Hibernian) to near post, header by Paul Hanlon (Hibernian) from left side of penalty area (12 yards), missed left. Goal kick taken long by Darren Randolph (Motherwell). 49:03 Shot by Mark Reynolds (Motherwell) drilled right-footed from left channel (30 yards), missed left. Goal kick taken long by Graham Stack (Hibernian). 47:58 Colin Nish (Hibernian) caught offside. Free kick taken right-footed by Darren Randolph (Motherwell) from own half, resulting in open play. Foul by Souleymane Bamba (Hibernian) on Jamie Murphy (Motherwell). Free kick crossed right-footed by Tom Hateley (Motherwell) from right channel, clearance by Colin Nish (Hibernian). 47:37 Shot by Jamie Murphy (Motherwell) drilled right-footed from centre of penalty area (20 yards), save (caught) by Graham Stack (Hibernian). 46:37 Attacking throw-in by Paul Hanlon (Hibernian). 46:06 Steven Saunders (Motherwell) caught offside. Free kick taken right-footed by Graham Stack (Hibernian) from own half, resulting in open play. 45:38 Inswinging corner from left by-line taken right-footed by Tom Hateley (Motherwell) to far post, clearance by Chris Hogg (Hibernian). 45:00+2:06 The first half comes to an end. 45:00+2:00 Defending throw-in by Paul Hanlon (Hibernian). 45:00+1:06 Assist (header) by Souleymane Bamba (Hibernian) from centre of penalty area. 45:00+1:06 GOAL - Anthony Stokes:Motherwell 1 - 1 Hibernian goal by Anthony Stokes (Hibernian) right-footed (bottom-left of goal) from left side of six-yard box (6 yards).Motherwell 1-1 Hibernian. Correction - 45:00+0:37 Assist (header) by Souleymane Bamba (Hibernian) from centre of penalty area. Correction - 45:00+0:37 GOAL - Anthony Stokes:Motherwell 1 - 1 Hibernian goal by Anthony Stokes (Hibernian) right-footed (bottom-left of goal) from left side of six-yard box (6 yards).Motherwell 1-1 Hibernian. 45:00+0:08 John Sutton (Motherwell) caught offside. Free kick taken right-footed by Graham Stack (Hibernian) from own half, resulting in open play. 43:56 Defending throw-in by Michael Hart (Hibernian). 42:24 Foul by Colin Nish (Hibernian) on Stephen Craigan (Motherwell). Free kick taken right-footed by Darren Randolph (Motherwell) from own half, resulting in open play. 41:49 Attacking throw-in by Michael Hart (Hibernian). 40:42 Foul by Mark Reynolds (Motherwell) on Anthony Stokes (Hibernian). Free kick taken left-footed by Paul Hanlon (Hibernian) from left wing, header by Chris Hogg (Hibernian) from centre of penalty area (12 yards), over the bar. Goal kick taken long by Darren Randolph (Motherwell). 40:26 Defending throw-in by Paul Hanlon (Hibernian). 40:00 Attacking throw-in by Steven Saunders (Motherwell). 39:23 Shot by Tom Hateley (Motherwell) right-footed from left wing (20 yards), save (caught) by Graham Stack (Hibernian). 38:48 Corner from left by-line taken short left-footed by Tom Hateley (Motherwell). 37:52 Shot by Kevin McBride (Hibernian) drilled right-footed from right side of penalty area (18 yards), save (parried) by Darren Randolph (Motherwell). Outswinging corner from right by-line taken right-footed by Derek Riordan (Hibernian) to far post, clearance by Stevie Hammell (Motherwell). 36:32 Attacking throw-in by Steven Saunders (Motherwell). 35:54 Attacking throw-in by Steven Saunders (Motherwell). 35:36 Attacking throw-in by Steven Saunders (Motherwell). 35:08 Colin Nish (Hibernian) caught offside. Free kick taken right-footed by Darren Randolph (Motherwell) from own half, resulting in open play. 34:56 Shot by Tom Hateley (Motherwell) right-footed from right channel (20 yards), save (caught) by Graham Stack (Hibernian). 34:27 Attacking throw-in by Steven Saunders (Motherwell). 34:10 Defending throw-in by Steven Saunders (Motherwell). 32:14 Defending throw-in by Michael Hart (Hibernian). 31:29 Attacking throw-in by Stevie Hammell (Motherwell). 30:59 Defending throw-in by Michael Hart (Hibernian). 30:41 Defending throw-in by Steven Saunders (Motherwell). 29:45 Defending throw-in by Steven Saunders (Motherwell). 29:34 Attacking throw-in by John Sutton (Motherwell). 29:06 Attacking throw-in by Paul Hanlon (Hibernian). 28:06 Outswinging corner from right by-line taken right-footed by Chris Humphrey (Motherwell) to far post, header by Steven Saunders (Motherwell) from centre of penalty area (6 yards), over the bar. Goal kick taken long by Graham Stack (Hibernian). 27:49 Attacking throw-in by Steven Saunders (Motherwell). 27:41 Defending throw-in by Paul Hanlon (Hibernian). 26:37 Attacking throw-in by Steven Saunders (Motherwell). 24:46 Weak shot by Jamie Murphy (Motherwell) volleyed right-footed from left channel (20 yards), comfortable save (caught) by Graham Stack (Hibernian). 24:26 Attacking throw-in by Stevie Hammell (Motherwell). 23:58 Goal kick taken long by Darren Randolph (Motherwell). 23:34 Foul by Stevie Hammell (Motherwell) on Anthony Stokes (Hibernian). Free kick taken right-footed by Chris Hogg (Hibernian) from own half, resulting in open play. 23:13 Defending throw-in by Paul Hanlon (Hibernian). 21:25 Defending throw-in by Stevie Hammell (Motherwell). 20:59 Goal kick taken long by Graham Stack (Hibernian). 20:03 Defending throw-in by Michael Hart (Hibernian). 19:14 Attacking throw-in by Stevie Hammell (Motherwell). 18:02 Foul by Keith Lasley (Motherwell) on Anthony Stokes (Hibernian). Free kick curled right-footed by Derek Riordan (Hibernian) from left channel (30 yards), over the bar. Goal kick taken long by Darren Randolph (Motherwell). 17:24 Shot by John Sutton (Motherwell) volleyed left-footed from centre of penalty area (12 yards), save (parried) by Graham Stack (Hibernian). 16:54 Foul by Souleymane Bamba (Hibernian) on Keith Lasley (Motherwell). Free kick taken right-footed by Stephen Craigan (Motherwell) from right wing, resulting in open play. 15:59 Attacking throw-in by Michael Hart (Hibernian). 15:47 Defending throw-in by Michael Hart (Hibernian). 15:24 Defending throw-in by Michael Hart (Hibernian). 15:05 Defending throw-in by Michael Hart (Hibernian). 14:34 Defending throw-in by Michael Hart (Hibernian). 13:50 Defending throw-in by Paul Hanlon (Hibernian). 12:44 Assist (cross) by Tom Hateley (Motherwell) from left wing. 12:44 GOAL - John Sutton:Motherwell 1 - 0 Hibernian Goal by John Sutton (Motherwell) right-footed (bottom-right of goal) from centre of penalty area (6 yards).Motherwell 1-0 Hibernian. 12:23 Attacking throw-in by Stevie Hammell (Motherwell). 11:54 Colin Nish (Hibernian) caught offside. Free kick taken right-footed by Darren Randolph (Motherwell) from own half, resulting in open play. 11:16 Goal kick taken short by Graham Stack (Hibernian). 10:24 Handball by Kevin McBride (Hibernian). Free kick taken left-footed by Stevie Hammell (Motherwell) from own half, resulting in open play. 9:47 John Sutton (Motherwell) caught offside. Free kick taken right-footed by Graham Stack (Hibernian) from own half, resulting in open play. 8:29 Attacking throw-in by Steven Saunders (Motherwell). 8:17 Shot by Jamie Murphy (Motherwell) drilled right-footed from left channel (35 yards), save (caught) by Graham Stack (Hibernian). 6:26 Foul by Keith Lasley (Motherwell) on Souleymane Bamba (Hibernian). Free kick taken left-footed by Paul Hanlon (Hibernian) from own half, resulting in open play. 5:57 Defending throw-in by Michael Hart (Hibernian). 5:14 Goal kick taken long by Darren Randolph (Motherwell). 4:53 Outswinging corner from right by-line taken right-footed by Derek Riordan (Hibernian) to centre, clearance by Stephen Craigan (Motherwell). 4:07 Shot by Anthony Stokes (Hibernian) curled right-footed from left side of penalty area (12 yards), brilliant save (with feet) by Darren Randolph (Motherwell). 3:36 Goal kick taken short by Graham Stack (Hibernian). 3:19 Attacking throw-in by Stevie Hammell (Motherwell). 3:04 Defending throw-in by Michael Hart (Hibernian). 2:43 Defending throw-in by Michael Hart (Hibernian). 1:43 Outswinging corner from right by-line taken right-footed by Chris Humphrey (Motherwell) to near post, clearance by Michael Hart (Hibernian). 0:06 Attacking throw-in by Steven Saunders (Motherwell).